A division of Alent plc, Enthone is a leading global supplier of high performance specialty chemicals and coatings. The company's products provide innovative and cost-effective technology solutions for a wide range of markets and applications worldwide. Enthone operates in more than 50 countries and has ten manufacturing facilities and nine technical centres strategically located worldwide. The company's coatings add value to a diverse range of metals, plastics and other substrates by changing their performance characteristics in a variety of ways. Leading global OEMs depend on Enthone coatings to enhance wear and corrosion protection, improve efficiency, extend working life and enable electronic performance. Industries served include the Automotive, Building Hardware, Electronics, Heavy Equipment, Energy & Chemicals and the Aerospace & Defence sectors. Based in Woking, Surrey, Enthone Ltd operate from an impressive high-tech research, manufacturing and admin facility. In accordance with Alent plc corporate policy, Enthone Woking focus on achieving high customer satisfaction through registrations to international business standards, including ISO 9001 Quality Management System (QMS) and ISO/IEC 17025:2005. As with all company facilities, Enthone Woking places its emphasis on the process approach, giving ownership of a business process to those who undertake it. Whilst making them responsible for measuring effectiveness, improving performance, and reporting targets and trends to the respective Sr. Leadership Team. The view of the company's Senior Business Leaders is that quality, environmental aspects, and occupational health and safety (OH&S) are embedded and integrated into every function, with process owners being responsible for the efficiency and effectiveness of a process under their control. To ensure the delivery of the best possible products and services, in addition to adhering to exacting quality standards, Enthone, Woking invests heavily in state-of-the-art testing and inspection equipment. Some of Enthone Ltd's customers require the coatings that they apply to be independently tested by an accredited test house working to the exacting standards of ISO/IEC 17025. This is typically for high value, high performance and safety critical applications. Steve Grimsley, Enthone Ltd Business Development Manager, Explained. “We were recently tasked with very accurately measuring the critical hardness values of which are applied to components being supplied for an offshore Oil and Gas project. Given the extremely harsh, sub-sea environments the components were due to be used in, the quality of the deposits and coatings were of critical importance to their extended life. 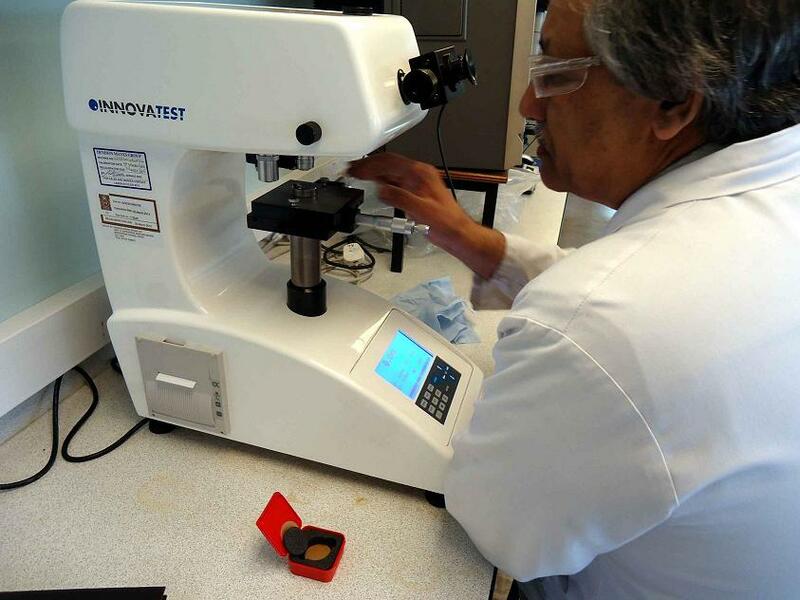 “As our existing equipment was unable to perform the required tests, and given our tight deadline, due to a forthcoming audit, I immediately undertook a search for a suitable, accurate Micro-Vickers Hardness Tester. “Having compared the technical specification of hardness testers from 3 – 4 manufacturers, I concluded that the Innovatest Micro-Vickers machine supplied by Bowers who are the exclusive agents for the UK was ideal for our particular needs. In addition, given our time constraints, Bowers were able to deliver from stock. “The Innovatest hardness tester was installed in good time for our audit and given the machine’s ease of use, our operators mastered its simple controls after a very short training session”. “Now in regular use, our new hardness tester has proven to be very accurate and repeatable, in addition, as the machine was supplied with certified test blocks, it is in accordance with our quality standards, as all of its findings are traceable to national standards”. The advanced Micro-Vickers bench-mounted hardness tester boasts a motorised turret, easy to use integrated hardness calculators, and dependent on the model, analogue or digital measuring microscopes. All models feature a fully automatic, 4 position turret for Micro-Vickers and Knoop scale measurement. The choice of turret configurations consists of 3 objectives and 1 indenter, or 2 objectives and 2 indenters (Vickers and Knoop.) In addition, a dual Vickers / Knoop turret option is also available. Bowers Micro-Vickers Hardness Testers are able to store up to 20 test results and if required hard copy of all gathered data can be printed using the testers built-in high-speed thermal printer, whilst an RS 232 data output allows all results to be downloaded to a PC. The optional CCD-View IMPRESSIONS software enables automatic measurement and the storage of infinite amount of test results and full reporting function. For more information on Bowers' Testing Instruments range, click here.